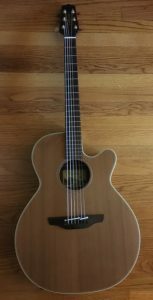 I never wanted a Takamine, but I bought this guitar new in 2000 (or 2001) at a giant music store in Charlotte, NC. I played every acoustic guitar in that store and tried to have an open mind (regardless of brand swagger) of how the guitar played and sounded. There was nothing in the store that compared to this guitar. It was perfect for me. 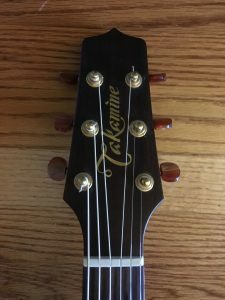 So, there I was with a Takamine, and I played it through my “singer-songwriter” period in Asheville… when in Rome, right? I played with Ben Graham, previously of Callie’s Paw from Greensboro, NC. We did a duo thing we called Broadwater Graham. Then, I did solo gigging for a while. I did not enjoy that at all. I was trying too hard. I was trying to have merch and book gigs and play long sets and get paid. It was no fun at all. I’ve always loved this guitar though. 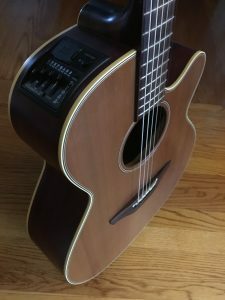 I tried to buy “cooler” guitars to replace it – Martin, Gibson, Epiphone, and more. But I always kept this and sold those others. This guitar is the brightest, best-sounding, easiest to play acoustic I’ve ever played. It sounds great plugged in too with good pickups and preamps. It also has a built-in tuner and EQ (which was VERY helpful when I was gigging in coffee shops and bookstores and such, battling whatever PA the venue had cobbled together). Plus, I think the guitar is beautiful. It’s lacking any adornment at all (not even a pick guard) and just relies on the wood to be rich and beautiful in its own right. 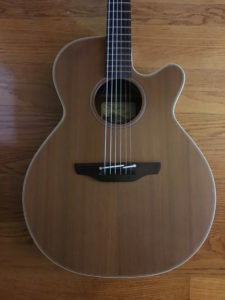 It has a solid cedar top and a solid mahogany back, both with a thin satin finish that just makes the guitar still feel like it’s just natural wood in your hands, but super silky smooth wood. And the rosewood fingerboard feels great to play. I have lighter gauge strings on it (my preference).